Yesterday we took a pleasant bike ride around the Eastern Point area of Gloucester, a peninsula that sticks out into Gloucester Harbor. I’ve driven around the loop any times, but it was only as we began exploring some of the side roads that we discovered entire areas that we didn’t realize existed. Following one such road took us back among the summer houses of the absurdly rich, one of which was the Beauport, former home of interior designer Henry Davis Sleeper. Eventually we ended up at the Eastern Point Lighthouse and the Gloucester Tidebreak. 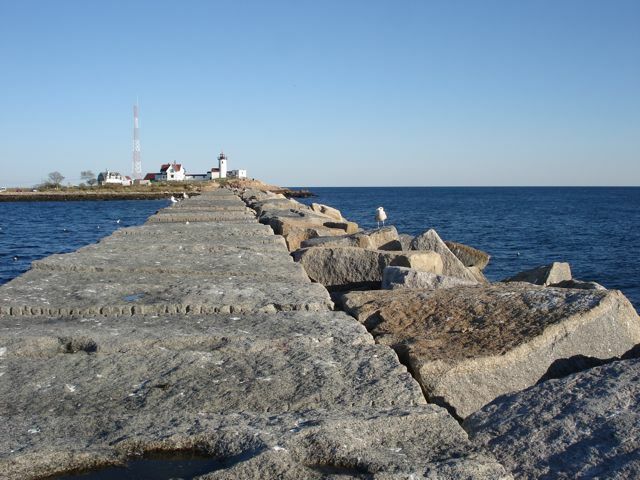 Walking out to the end afforded us fine views of both the lighthouse and downtown Gloucester. On our way home we swung through the Rocky Neck Art Colony, which the oldest active art colony in the country. Unfortunately, most of the galleries were closed for the day, and most everything else seemed to closed for the season. I just returned from a trip out to California for Monica’s wedding, a trip I extended so I could visit folks down the coast. I ended up with a cross-section of CA, stretching from Bodega Bay north of San Francisco, down the coast through Santa Maria and Santa Barbara, ending up in LA. Since this is long overdue, as usual, I’ll just summarize things briefly. For photos, check out the CA Trip Gallery. I began in San Francisco, where I picked up TJ, Lara, and Richard at the airport and then we drove north to Monica and Simon’s wedding near Occidental, stopping along the way for a hike in the Muir Woods. The wedding was a weekend affair at a camp in the woods, with the ceremony outdoors in a stand of Redwoods and many of us staying in cabins for two nights. On Sunday I met up with Pica and Numenius at the Seaweed Café in Bodega Bay, and we had an enjoyable chat as always. As usual, I felt like was just visiting from the other side of town, and we easily picked up where we left off. Yes, I’m willing to go to any lengths to further my “dissertation research,” even if it means meeting up with smart, interesting bloggers at a great brunch spot on a beautiful morning in northern California. From there I drove into San Francisco, with a stunning late-afternoon view of the Golden Gate Bridge and the city in the distance to welcome me. Ajai and I hiked up to a park overlooking the city and then had burgers in the Mission District. That evening, I stayed with Andy and Rebecca in Palo Alto and had just enough to catch up briefly before I hit the road Monday morning at about six. Monday I spent the morning and afternoon driving down the Pacific Coast Highway, stopping near Big Sur to watch about 15 condors hanging out along the highway. Further along the way I paused to check out the Elephant Seals lounging on the beach. By afternoon I arrived in Santa Maria where I enjoyed lunch with Elaine and got a tour of her stomping ground. I then drove another hour to Santa Barbara to visit Andrea, who has just moved there from Boston to take a job teaching psychology. Tuesday afternoon I completed the last leg of my journey to LA to visit Sara and Brian in Echo Park. It’s crazy to think that I’ve been in California four times in the last year and half–enough to let me get in touch with California Tim, long repressed by my East Coast life. Though I’m beginning to feel like deep down I’m really a West Coast guy, the conclusion of these trips always force me to make peace with my life in Boston again. We’ve learned to work through our differences, Boston and I, and so last Thursday when I emerged groggy and stiff from my overnight flight back to Logan, I was willing to feel like I was home. Halibut Point State Park in Rockport, MA.